John Marshall built his first flax mill in 1791 on an open patch of undeveloped land in Holbeck to the south of the Leeds Liverpool Canal and to the north of the Hol Beck. He paid William Naylor £600 for an acre-sized freehold plot on what was already known as Water Lane a year earlier in 1790. He wanted to relocate his flax spinning business there due to the commercial benefits offered by transportation via the newly completed canal and the power source provided by the Beck. Also, the local population of the nearby village of Holbeck provided a plentiful supply of willing and available workers. By September 1791 ‘Mill A’, as it became known, was fully erected and producing. This followed four years of largely trial and error development in a smaller mill at Adel, called Scotland Mill, where Marshall had worked with several partners and investors, including a promising young engineer called Matthew Murray. Murray eventually patented the flax spinning machinery that would make Marshall’s millions, and he and Marshall crucially developed a way to replicate the machinery to mass-produce. And hence the industrial revolution in Leeds was born. Mill A was four storeys high and around 9,000 square feet in size. The following year a hackling shop was built, and a warehouse, counting house, drying sheds, smiths and joiners’ shops, a retaining wall to the north of the Beck and a number of smaller structures including domestic dwellings, storage, gas houses and stables. At first Mill A was water-powered but they soon developed steam power in the form of a 20HP steam engine manufactured by Boulton & Watt. Marshall was on his way to vast riches. John Marshall was the first industrialist to build a mill in the area, which in little over 40 years’ time would be a thick and unsightly concentration of machinery, noise, people and grime. By the mid-1800s Holbeck was an area so polluted by industry it was said that “even the crows fly backwards to avoid getting soot in their eyes”. But Marshall’s hunger for development meant he had built a second mill before the city’s movers and shakers had even worked out what he was doing. Within two years Marshall had sought further expansion in the new industrial heartland of Holbeck, this time funded by accepting £9,000 in capital from customers Thomas and Benjamin Benyon of Shrewsbury for a half share of profits. In 1794 the new partnership bought more land on Water Lane from David Rider for £2300. Part of this was adjacent to Mill A for construction of Mill B, and another part was on the south side of Water Lane for future expansion. Mill B was an ambitious five storeys high and at 29,000 square feet was three times the size of Mill A, thus reflecting the speed with which Marshall’s empire was developing. Mill B started production in September 1795, but a tragic fire in February 1796 completely destroyed it, killing seven workers and injuring a further 20 in the process. Marshall couldn’t hang about though. Fortunately for him, Mill B was only half filled with machinery at the time of the fire, causing £10,000 damage, half of which was covered by insurance, the other half by healthy profits already generated through the need for yarn as a result of a declaration of war with France in 1793. Therefore, Mill B was rebuilt immediately and finished in July. By the end of the year Marshall had 1800 spindles working in it and it was business as usual. Alas, apart from feint detail on historical maps, not much is known about Marshall’s first two flax mills, except that they made his fortune and helped develop Leeds as a global centre of industry. We know that by 1815 both mills were fully developed, but that Globe Road to the north of the site was yet to exist and instead there was just an open expanse of farmland. In the same year, Marshall started his development south of Water Lane, building Mill C as the first segment of the towering construction that still rises imposingly over Marshall Street today. This was bigger still than Mill B, and eventually led to the development of wet spinning, a technique that revolutionised the industry and gave Marshall’s business a much-needed shot in the arm in the face of a post-war malaise. 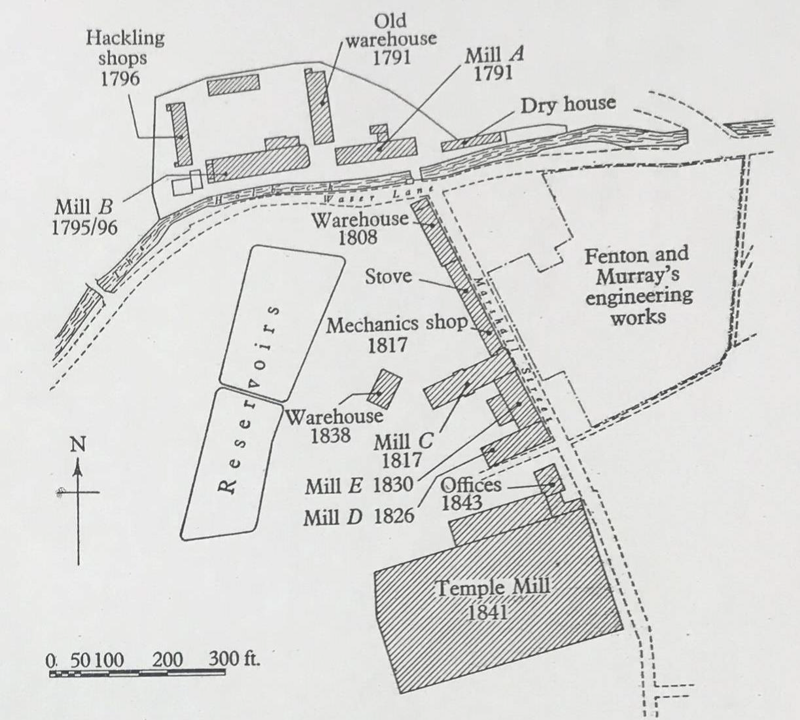 Wet spinning led to Marshall building adjoining Mills D and E, forming a U-shaped complex with Mill C, and finally to the ‘jewel in the crown’ of Temple Mill in 1838. By this time, the original Mills A and B had become outdated, and indeed, Mill A was demolished in 1837 with Mill B eventually meeting a similar demise in 1852. It seems amazing that in 2019 we are still learning things about what happened 167 years ago. But then you can’t halt progress, and when an area has a smell of industry it is hard to stop it. The cooling reservoirs on the Mill A and B site were filled in and replaced by an underground culvert to river, which served Marshall’s other mills. The Marshall family abandoned that ground, but on it was quickly built a succession of industrial buildings including stabling for the railways, G & R Mortimer's Monk Bridge Bobbin and Shuttle Factory, a timber yard and in the early 1900s a chemical works. Part of the land was also affected by the construction of the Holbeck Viaduct, a hulking construction built as part of the London and Western Railway in 1882. Much like the eruption of Mount Vesuvius buried the ancient city of Pompei in layers of volcanic dust, so the scene of Marshall’s fledgling empire has been similarly preserved beneath overlaying construction waste. Or so we have recently discovered. As part of the successful planning application for mixed use development by CEG, Northern Archaeological Associates (NAA) carried out a series of small excavations between September and November 2016. 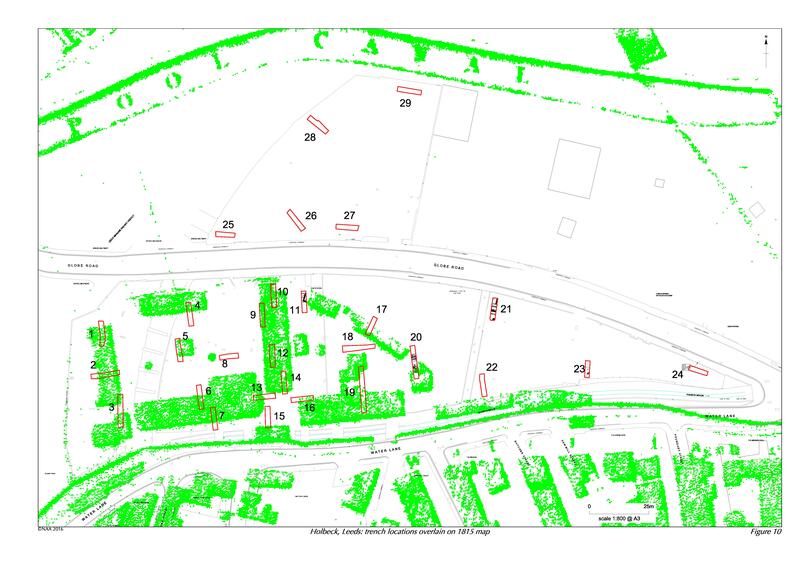 Commissioned by CEG, NAA identified 29 areas on the original site of Mills A and B, by then a dis-used brownfield site, which mirrored the known footprint of the mill buildings based on historical mapping. The objective of digging the 29 exploratory trenches was to establish the presence, nature, extent, preservation and significance of any archaeological remains within the site. Also, the plan was to record the findings and recover associated evidence, to determine which areas within the footprint of the proposed South Bank scheme might require archaeological mitigation in the form of preservation in situ, and whether anything needed to be preserved during construction or identified for further investigation. These evaluation trenches cut through a prohibitive miscellany of construction waste, demolition debris and industrial deposits built up over years of ‘modern’ construction, but unearthed wall foundations, stone-paved and cobbled foot surfaces, engine platforms, chimney bases, ceramic drains and other underground works. In addition, a painstaking hand excavation also unearthed a collection of artefacts including pottery, metal, animal bones, items of dress, leather from women’s shoes and personal items such as a teaspoon and a toothbrush. While hard to date specifically, these were mostly identified as being left or discarded in the time of Marshall’s occupation of the site, and all offered small clues as to the style of work and welfare practices of the time. Animal bones were found from sheep, cattle, pigs and a cat, all of which, apart from the cat presumably, are expected to have been food waste, while the pottery was various forms of domestic wares, some of which was identified as being sourced from the Lazencroft factory, which produced pottery in east Leeds at the time. Miscellaneous items found included extensive window glass, a ceramic marble, a leather gasket, an iron nail, and fragments of clay pipe stem, with the only evidence of machinery as such being a small flywheel. None of this is considered of great archaeological importance unfortunately, but crucially, the trenches targeted the majority of the buildings thought to have existed on Marshall’s site, although the degrees of structural preservation varied. They also gave clues as to certain events during Marshall’s time, such as building expansions and occasions of localised flooding, and they offered evidence that much of the subsequent construction on the site was built using Marshall’s original foundations; it being fairly easy to identify which of the construction was 1790s and what came much later. 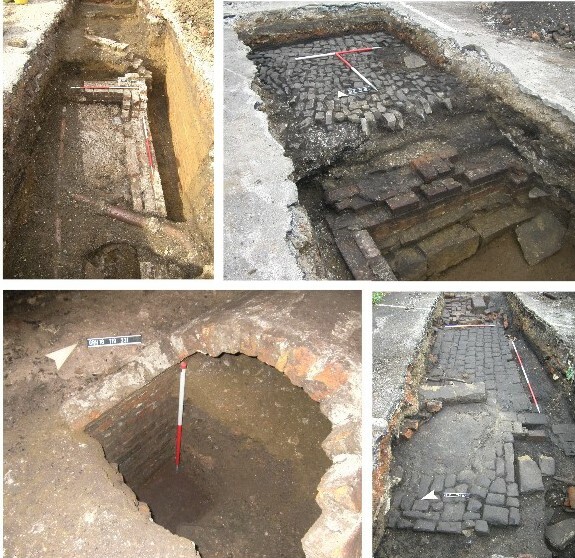 The findings from the archaeological digs were referred to West Yorkshire Archaeology Advisory Service (WYAAS) to assess the significance of any remains, and whether they would affect the development proposals. A report dated April 2017 by NAA details these findings, and in June 2017 an additional three trenches were dug to further investigate and identify underground brick-vaulted water culverts. All this archaeological recording has awaited further development until planning permission for the site overall was granted in late 2018, and WYAAS confirmed the method statement for the further archaeological investigations. An accumulation of debris from construction and manufacturing processes in the 19th and 20th centuries has protected the surviving architectural elements at a typical depth of 0.5-1m. Hence the plan now is to excavate all of those areas of the site where intriguing remains may lie, once demolition clearance of existing buildings has been completed. Project management specialists Pierre Angulaire are working in conjunction with CEG and have engaged archaeological excavation experts (Ecus Ltd) to unearth, or as appropriate leave in situ, interesting remains of both Mill A and Mill B. From this exercise it can be decided whether any features can be reflected into new designs for the South Bank development of the site, but the greater understanding of the pinpointed and true ‘birthplace’ of the industrial revolution in Leeds will be a worthwhile outcome in itself. The archaeological excavations are due to start before the end of March 2019 and the first phase will last five weeks. It would be wonderful to think that some of the walls, paved walkways, cobbled paths and brick structures can somehow be reflected in the new public realm or incorporated into the foundations of spanking new, high-rise structures, essentially meaning that John Marshall still has a hand in the future prosperity of Leeds, and importantly, that Leeds is still remembering him, still thanking him and still preserving his legacy.